Ray has been designing multihull yachts for over 20 years and there are many beautiful boats made by satisfied customers all over the world. Ray�s philosophy is to design trailer-able boats that can be built by the home builder. He provides all the necessary drawings and is readily available for help or encouragement. He realises that building a boat can be a life changing experience and wants to encourage other people to find this happiness. Ray built his first boat when he was 14 years old, saving up money from a paper run and making his sails on his mother�s sewing machine. He has always been obsessed with designing and sailing boats since he was in high school. When he could spare time from boat designing he worked as a structural draftsman so his plans are detailed and professional. 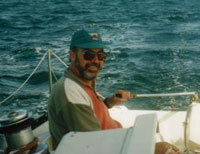 He has been an avid dinghy sailer in Sydney most of his life, sailing on the Parramatta River. He met Fran Sneesby while they were in Kindergarten and they became fierce rivals sailing against each other soon after. They lived on the same street and were inspired by their fathers who were both mad boat builders. Ray continued to race dinghies while Fran wandered over the waves and sailed with the big boys in Texas. When they came back together Ray was frantically designing one boat after another and Fran was a not so successful mango farmer in SE Queensland. They combined their talents and built a couple of boats together and decided to form Team Scarab. (Originally Ray sold his plans through Kendrick Design). Now they build boats for the love of building and to test prototypes of new designs. Plans for all the designs are available through Team Scarab Pty Ltd in PDF format with DXF cutting files so the panels and bulkheads can be CNC routed or laser cut.